That has to be the question many producers are asking each other — and anyone else who will listen — as record slaughter numbers seem to have limited impact on cash prices and apparently no impact on Lean Hogs futures prices. The answer is that this is not your father’s pork industry. It is something completely new. Or at least so different from the past decade that it looks like something completely new. Let’s count the differences. The United States’ subsidized and mandated ethanol program began in the mid-2000s, and pushed corn demand higher at a faster pace than U.S. corn producers could raise corn output. The result was corn prices that rationed the available supply by forcing other corn users to reduce their usage either by contracting their businesses or by finding alternatives to corn. The U.S. pork industry stopped growing and found alternatives, but costs of production rose sharply from the low $50s per hundredweight carcass to $60 to $80 per hundredweight carcass. Then the drought of 2012 came along and made the situation much worse, pushing costs to a record of $95.60 per hundredweight carcass for hogs sold in October 2012. Those bad old days are over (at least for now), and costs have been in the low-$60s the past two years and are expected to remain that way based on corn and soybean meal future prices as of Nov. 6. Large projected 2018 year-end stocks suggest that these cost levels are likely to continue. One crop failure would certainly push costs higher, but it would take the failure of two straight U.S. crops or successive failures in the United States and South America to push costs anywhere near those 2012 highs. Export demand has been robust all year and apparently remains strong given lower wholesale prices and the relatively weak U.S. dollar. Exports through August had exceeded year-ago levels by nearly 9%. We don’t think fourth quarter exports will match that growth rate primarily due to excellent exports last year in November and December. But a stronger peso should help exports to Mexico — where they were up 20.6%, year-on-year, through August — remain large even if they are smaller than those high totals of last fall. On the domestic front, export struggled mightily in January and February but has improved steadily versus one year ago since then. Real per capita expenditures for pork (a good gauge of that status of consumer-level demand) were 4% higher than one year ago in July and August. Though much lower than this summer, relatively strong wholesale pork prices are an indicator that domestic demand is still good — especially when one considers the supply situation. We believe the export situation is primarily dependent on trade issues, at least to the downside. Current rancor over the North American Free Trade Agreement, Korea-U.S. and just about all of our other trade deals has cast a pall over future trade even though the current situation is good. Even a trade negotiation failure would not have an actual impact until 2019 at the earliest but just how much might bad blood and bad attitudes impact sales? The borders won’t close, but U.S. product will become more expensive if these trade deals go away. Won’t some buyers turn elsewhere to make sure they have supplies available at reasonable costs? And the European Union-Japan free trade deal goes into effect Jan. 1, 2019. That will begin the process of reducing tariffs on EU product. Our deal to get that done went away with the failure of the Trans-Pacific Partnership. Where are the promised bi-lateral agreements to replace it? Domestic demand would benefit from wage and personal income growth. Real per capita, disposable personal income grew by only 0.7% last year and has grown by only 0.4% this year. Low unemployment should eventually push wages higher, but we have seen scant evidence of that so far. Lower beef prices will weigh on domestic pork demand. I fear that bellies can’t come to the rescue every time we need a demand shot in the arm. Lots of hogs, but just how many? 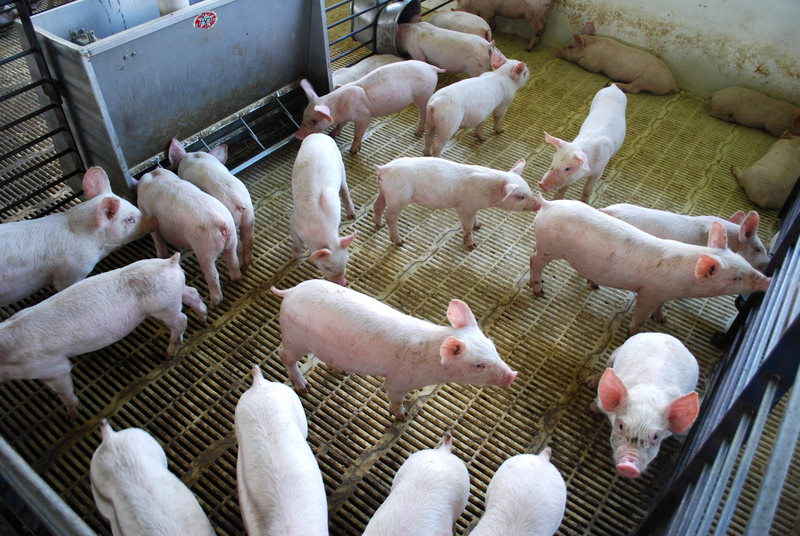 USDA’s September Hogs and Pigs report says there were plenty coming and we have seen plenty. Packer margins, however, have declined to the point that packers aren’t nearly as enthusiastic about keeping hogs moving and several plants were idle last Saturday, limiting weekly slaughter to “just” 2.453 million head. That compares to our slaughter forecast of 2.577 million. My “slaughter” forecast is actually a forecast of the number of hogs that would be available last week. Whether packers choose to kill them or not is really another question. They can’t harvest them unless they are available, but they can choose to wait. I am a bit concerned that this is happening but weights have increased 2 pounds since the first week of October and the average for the same period over the past five years is 1.8 pounds. That difference is not alarming at all. Further, there doesn’t appear the kind of pressure yet on cash hogs that would say there are a lot of pigs desperately needing a home. That may change anytime, but we are close to the end of the slaughter window for USDA’s 120-179 pound category in the September report. Did they over count those pigs? Did they under count the 60-119 pound group? Recall that it was only 1.8% larger than last year, nearly 1% lower than analysts had expected. The real kicker is that we know producers’ responses on the weight category questions in the hogs and pigs survey are not much more than guesses. So what do you do? Don’t look a gift pig in the mouth! December futures aren’t at $68 anymore, but they are still over $64. February is near contract highs at $72 and change. Ditto for April at $75.60. Summer months are at their contract life highs, but given what has happened so far, I wouldn’t get too aggressive there unless you use an options strategy that leaves the top side open. My cost model (cost levels cited earlier) and these futures prices say that profits will average very near $20 per head in 2018. That figure applies to the best producers out there, but it is still impressive. If it comes to pass, it will be the third best year in the last decade behind only the porcine epidemic diarrhea virus-fueled 2014 and the swine flu rebound year of 2010. Not bad when supplies will be record large for the third year in a row. ← Which STEM Career is Right For You?